Mary Todd Earnhardt ’20 has her hand in just about everything, from nannying part-time, to exploring the outdoors, and working part-time with elementary school children – all while balancing a 3.6 GPA. 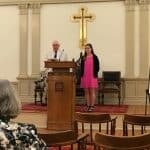 In addition, she’s active in her church, just one of the many reasons she was recently awarded the First Presbyterian Scholarship, a distinguished honor given by the Vanguard Sunday School Class, the oldest class of its kind in North Carolina. Mary Todd Earnhardt ’20 receives the First Presbyterian Scholarship. WPU’s ties to the church run deep and steadfast, having been founded in 1857 by William Peace, a Raleigh businessman and church elder, who pledged $10,000 to the Rev. Joseph M. Atkinson in trust for the First Presbyterian Church. This prestigious scholarship has been annually awarded to one lucky Peace student for decades; more than 50 years to be exact. It’s an honor Mary Todd doesn’t take lightly, and is a torch she’s proud to carry. Earnhardt’s ties to the Church not only run deep, as she’s attended Western Blvd. Presbyterian Church since she was a child, but her ties to Peace do as well – decades in fact. 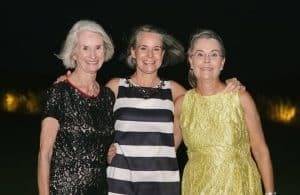 It started with her aunt, Susie, who first graduated from Peace in 1965, then, her other aunt, Bess, in 1975, and finally her mother, John Ann, in 1984. All three women walked the front lawn of Main, sang the Alma Mater, and threw their roses into the fountain – traditions that still hold true to this day. Mary Todd’s mother, John Ann [middle], and her two aunts, Susie [left] and Bess [right], all attended Peace. Mary Todd even went as far as describing her mother’s experience with a current faculty member – Adair Robertson. Robertson, Associate Professor of Mathematics and Coordinator of International Studies, has been at Peace for more than 30 years and had a profound impact on John Ann. “She [Adair] had my mom in class. My mom wanted to become a math major because of her, actually,” Mary Todd chuckled. 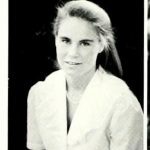 Mary Todd’s mother, John Ann, attended Peace in the 80s. As an Elementary Education major, Mary Todd is learning the skills needed to become a successful educator. She’s not only heavily involved in the classroom, but outside of it as well, working at Combs Elementary School through Play-Well TEKnologies, a company that works with kids and local schools, teaching them engineering skills through the use of LEGOs. Mary Todd’s scholarship is worth $2,000 annually. To qualify for the William Peace First Presbyterian Scholarship, a student must be full-time, female, a member of a Presbyterian Church in Wake County, and submit an application.